We met a few years ago in San Salvador and I remember that you were sincerely welcoming. I still have vivid memories of the time we spent together. Your look was deep and your talk was reflective and wise. And behind your small size and your simple appearance there was a strong and positively energetic presence. In our conversation we talked about the massacre of the university students in San Salvador in 1975. I had heard of it – the newspapers reported it in different ways because it was not easy to talk about government repression at that time – but what I did not know is that you and a little group of women went to the streets some minutes afterwards to help those young people who were hurt. That went unnoticed and it surely did not make the news. You and your women friends chose – and risked, to go instead of remaining paralyzed; you chose hope instead of dismay. And then you told me how you and some of the other women ended up forming – years later, the Committee of Mothers of the Disappeared “Oscar Romero”. Your Committee – COMADRES, would become one of a kind: A group of brave women who were able to stand up and speak out for justice claiming the truth over the disappearance of your sons and relatives who had been violently taken away from you. You, courageous women, faced military brutality many times but you resisted. You overcame fear because your hearts had overflowing love and hope; because justice and peace were burning in your souls. With incredible determination, you overcame violence with active nonviolence. You saw little windows of opportunities, where many others saw only despair; you saw light coming from little cracks and you decided to follow it. Mainstream communications channels in our world – especially the big media, dedicate overwhelming amounts of space and time to tell stories of violence and war, to describe carnages with sophisticated details, to explain the reasons why bloody conflicts make sense, and why we cannot expect something different from certain tribes, groups, peoples, or nations. But there is danger in having only one side of the story, and the danger is even more serious when that side is violence and when that side is depicted and justified as the only truth. Listening to one story only necessarily leaves behind other stories – sometimes more numerous, which are not heard because their storytellers are not as powerful as others. But that does not make their voices disappear. We need to pay more attention to those already existing voices; we need to pay attention to other sides of the stories as well. We need to look at little windows of opportunities the way you did, Alicia. Otherwise we will not be able to look or hear hundreds of thousands of small stories, ordinary stories, peace stories… And they will risk going unnoticed like those you told me; like those of you and your companions. We need to make peace storytelling pervasive! 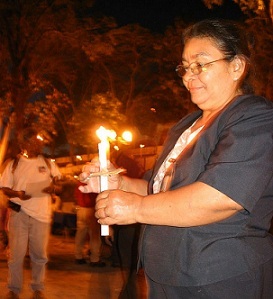 Pax Christi has affirmed for many years – almost seventy – the futility of violence as a tool to solve violent conflicts and its power to amplify and create devastating spirals of death. At the same time, our movement has been predominantly fostering cultures of peace from the grassroots – within small faith communities, within civil society groups, within local initiatives, and has helped bring their voices to wider and international audiences, to large forums, and also to selected decision-making spaces. Our efforts are based in our profound belief that peace is possible, that peace is a positive reality, that peace is already among us – yet always being created. We believe that by paying attention to those little windows of hope we can bring change and we can build peace. That was the seed planted in the hearts and minds of the first Pax Christi groups after the Second World War, determined to build reconciliation between French and German peoples. We need more peace storytelling and we need to pay more attention to peace storytellers. We deserve to have peace storytelling in our lives, as well. But more importantly, as peacemakers, we have also a vocation to share peace stories. Thank you, Alicia, for sharing your hope with me and with many other people around the world. And, since you are gone, please let me take some inspiration from you as we start this blog as a little window to share peace stories with all those eager to listen to the good news that peace is possible. Thank you, Jose. Thank you to the COMADRES who inspired and gave us hope!